The Huntley 158 Always Initiative is an umbrella concept focused on developing programs throughout the District that break down the barriers of the traditional school day. Primary among these efforts have been the District’s pioneering 1:1 initiative, recognized as the largest district-wide rollout of personalized learning devices in the State of Illinois, and Huntley High School’s unparalleled Blended Learning Program. Huntley 158 began implementing 1:1 learning with a pilot program at Martin Elementary School in 2012. In fall 2016, we completed our implementation with the high school juniors and seniors, cementing Huntley 158’s position as the largest provider of personalized learning devices K-12 in Illinois. Heralded not just for its size but also for the quality of curricular integration with technology, the District has presented at a number of statewide and professional conferences and continues to host several site visits every year from other school officials seeking to learn from its model. Enabling differentiation to meet the instructional needs of all students. 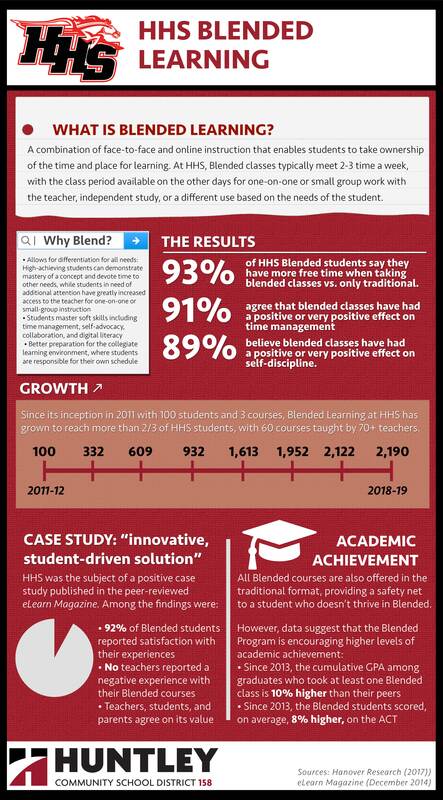 Blended Learning was piloted in 2011 with 100 students and three teachers. Since then it has exploded. In 2018-19, more than 2100 students (about 70% of the student body) is enrolled in at least one Blended class. Today, more than 70 teachers have taken their courses blended, with about 65 classes offered in Blended format, across all subject areas, from foreign languages to math to foods to PE. Unlike many online or technology-aided programs at charter or private schools, District 158 did not purchase a prepackaged system, curriculum, etc. Rather, the program was built from the ground up using existing staff and guided by the needs of HHS students. No significant capital expenditure was required. A high-achieving student who has mastered course material can complete the required work online without having to sit through class periods covering topics they’ve already mastered. A student who requires additional attention from the teacher can get it by visiting the teacher when the class does not meet as a whole to receive one-on-one or small group instruction. A student could use the class period for other purposes, such as meeting in small groups, completing work for another class, going off-campus, or taking a nap. He or she can then complete the Blended classwork at a time that better suits their schedule/learning style. The experience mirrors that of and better prepares students for college, where no one is telling you exactly where you must be and what you must be doing at any given time. However, a “safety net” exists in that students who fail to keep up in the Blended format. All Blended classes are offered simultaneously in the traditional format, and struggling students can transition to the traditional format. Blended students scored 8% higher on the ACT. HHS was the subject of a case study in the peer-reviewed journal eLearn Magazine and has been featured in national media including CNN, Parenting Magazine, and the GettingSmart blog.